The month of November offers many challenges for writers. National Novel Writing Month provides the encouragement and support for writers that want to create a new product in just thirty days. Blog Her introduced National Blog Posting Month for those that are more focused on their blogs than on writing a manuscript. See Jane Write Magazine created her own twist of NaBloPoMo with #BlogLikeCrazy. There are plenty of challenges to get the words down. The main part of each of these opportunities is that they create a habit of writing. So, it is not important what you write, but that you write. There is a direction for your what, you just have to choose to do it. Building a successful writing career – no matter what you are writing – begins NOW. It builds on now through persistence and consistency. Challenges can help you mark your path – but in the end only you can make your writing career happen. 1. Track when you are currently writing. Include the time that you write, what you get accomplished and even what circumstances surround you. The only to determine the writing time that works best for me is to measure the efforts that are invested. I have found that I can do a first draft in pencil and paper any time and any place, then take those drafts and put them into the computer when other circumstances (school) are vying for my attention. Keep a chart for a full month so that you can determine the pattern for your top writing moments. 2. Get beyond the excuses. The NaNoWriMo, NaBloPoMo, and #BlogLikeCrazy challenges focus on doing. There is no time for excuses. Others are doing it. You have accountability and encouragement to do. Every person involved has other things going on around them and they are finding a way to get it done. Consistency is not about making the perfect circumstances. Consistency it about doing despite what the circumstances might be. Consistency is also a vital component for a foundation of a successful writing career. 3. Keep going – even when you finish. A successful writing career (where the writer earns a living wage) comes from the continuous flow of words – and often the flow goes in a wide variety of directions. It is not enough to write A book. It is not enough to write A month’s worth of blog posts. It is not even enough to create A viral blog. You have to keep creating without fail. The when really is simple once it is broken down, and ultimately it breaks down to NOW. 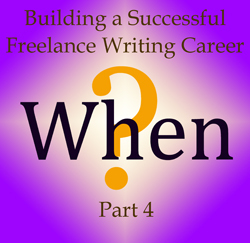 NOW is the when for your writing career.